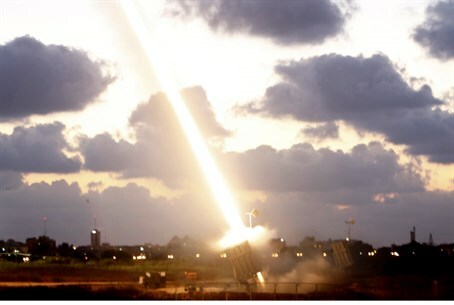 Iron Dome in action as Gaza terrorists target southern communities; Palestinian delegation head says no progress in talks. There are conflicting reports as to whether mortar shells or a rocket hit open ground in the Sedot Negev Regional Council area; there were no injuries or damage reported in the attack. All reports agree that rocket sirens were not sounded in the area before the attack hit. Meanwhile, the chief Palestinian negotiator conducting indirect talks with Israel for a long-term Gaza truce said there had been "no progress," with less than five hours to go before a temporary ceasefire expires. The Palestinian delegations presented their demands for a truce to Egyptian mediators and were awaiting Israel's response, said the official, Azzam al-Ahmed. "There has been no progress," he said of Tuesday's talks. "Matters have become more complicated." Thousands of Arab Gaza residents have reportedly begun fleeing their homes in eastern Gaza City after the rocket breach and IAF retaliatory airstrikes, reports AFP. One reporter for the French news agency stated that hundreds of residents were leaving the Shejaiya neighborhood, where some reports indicated the initial rocket fire had emanated from. Thousands more were leaving Zeitoun and Shaaf, according to witnesses. Hamas has not claimed responsibility for the renewed barrage of fire on Israeli civilian centers, but Hamas spokesperson Moshir al-Masri hinted responsibility in saying "if Israel wants calm, it must answer to the demands and rights of the Palestinians." The statement appears to suggest the rockets were fired by Hamas to try and press Israel to submit to its demands, which include releasing terrorists, as well as allow the establishment of a Gaza sea and airport. Indeed, Hamas has already declared that it is holding the truce talks with Israel being held "at gunpoint," and elaborated that any truce agreement would only be so as to plan the next terror war on Israeli citizens.